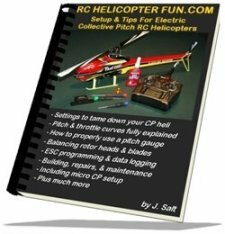 Both RC airplane and RC helicopter model gas engines have some interesting differences over our garden-tool variety engines. Gas engines are also commonly called "petrol engines" so you will often see that description as well. Pictured to the right is the Zenoah G231 2-stroke gas/petrol RC helicopter engine. It has a displacement of just over 22cc and produces just over 2HP. This engine has an idle speed around 3000 RPM and top speed of 11,000 RPM. It runs on a gasoline oil mixture of 32:1. Zenoah is one of the top manufactures of 2-cycle gasoline engines for RC helicopters and airplanes. Zenoah is known for reliability, long life, and excellent value. The video below I made shows the setup & operation of a Zenoah G26 airplane engine if you want to get a better understanding of how these little 2-stroke gas engines operate. 13:54 into the video is where I actually start it up if you are not interested in the radio programming part of gas engine setup. RC model gas engines are constructed with aluminum and even magnesium to save as much weight as possible. The pistons will be made of aluminum and many run inside a cylinder that is treated with nikasil. This is the same cylinder lining found in high performance motorcycle and car engines. It eliminates the need for steel cylinder sleeves saving even more weight. Nikasil plating is very thin (only several microns thick), it is however super tough and smooth. In theory, it should outlast the engine. 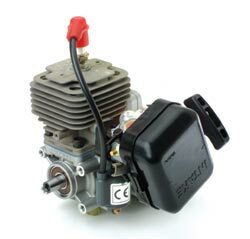 The other main difference you will find on RC model gas engines over a garden-tool engine is the very high quality carburetor that is used. As we already learned in the nitro engine requirements section, helicopters need a very reliable engine. You need the engine to react quickly to a throttle command, and maintain a steady speed. Some gas RC engines have even started using electronic ignition ; this will prove to be the next advancement that improves the power to weight ratio of gas. The 2-cycle model gas engine is quieter then a 2-cycle nitro engine simply because it doesn’t run at such a high RPM. Most top out around 12,000 RPM compared to 17-18,000 RPM typical of nitro engines. This might not be a big deal to some people, but if you live in an area with noise regulations, could be a factoar. Gas model engines are usually easier to tune than nitro engines and tend to be more reliable. 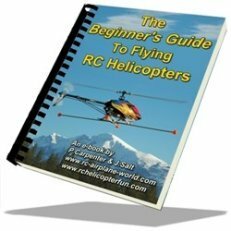 Very reassuring when flying an expensive large RC helicopter. If reduced noise and increased reliability are not reasons enough to understand the benefits of running gas, then operating costs surely are. A model gas engine will use significantly less fuel - roughly 50% less than an equivalent sized nitro engine that produces similar amounts of horse power. Gasoline is also much cheaper than nitro fuel (about 1/5th the price); do the math - gas will cost you roughly 1/10th of what nitro fuel will cost. Spark plugs also last much longer than glow plugs and actually cost less. I remember when glow plugs were pretty inexpensive and I would change them with each new gallon of fuel I used, just to be on the safe side, it was cheap insurance – not any more. What if you live in the middle of nowhere and because nitro fuel is considered a dangerous good it can’t be shipped? You now have to make a long trip into the city when you are down to your last jug of nitro fuel. Don’t laugh – I just described my own predicament and many others who live in rural areas. No worries if you have a gas powered RC helicopter, a trip to the local gas station with the good old jerry can and a few bucks later you are in good shape for many more flights. If all that hasn’t convinced you a gas powered RC helicopter might be the cats meow, how about not dealing with messy nitro oil goo any more. This is a secondary advantage and not really the main reason people switch from gas to nitro. However, talk to anyone who has made the switch, and it almost always comes up as the number one benefit they talk about. Face it – we all hate that oily goo! We already know that model gas engines don’t have the same power to weight ratio as their little nitro brothers. Hard 3D flying is simply not possible. Normal, sport, or light 3D is very possible. Spark plugs and high voltage ignition systems create a lot of “electrical noise” also called radio noise. In fact, the first experiments with radio transmission way back when used large spark generators to create radio waves that could be received over distances. You can also hear this noise on an AM radio when there is an electrical storm near by. Radio noise and radio control generally don’t get along as you can imagine. All this high voltage electrical noise can be received by your receiver in your helicopter or airplane. This is called interference and for those of us in the RC airplane and helicopter world we call it being “shot down”. Being shot down by a gun or radio interference has the same end result – a model aircraft that comes home in many small pieces. No worries however, this interference is really only a problem if you use AM radio gear which has pretty much gone the way of the dinosaur. FM or PPM is still susceptible, but not nearly as much as AM. Pulse Code Modulation (PCM) will ride out any noise it gets from a gas engine and now with 2.4 GHz Spread Spectrum Modulation (DSM), very rarely will high voltage ignition systems cause any issues. In short, with today’s radio gear, gas engine ignition noise is not the problem it once was. The other issue with model gas engines is the large quantities of vibration they produce. This is a much bigger problem for our RC helicopter than radio interference. Every engine with a piston vibrates because the piston is moving up and down. Every time the piston changes direction, some of the energy is given off in the form of vibration. Every effort has been made to reduce these vibrations by counter weighing the crank shaft, but it is impossible to eliminate them all together. The less mass the piston has, the less energy is given off as vibration. That is why our little nitro engine doesn’t produce nearly as much, the piston is very light. The other way to reduce the vibration is to use two of more cylinders so the vibrations of each are timed to cancel out. This of course is not an option for our small single cylinder RC helicopter gas engine. The main concern with vibration is how it can loosen nuts, bolts, and set screws over time. The other concern is how servos, receivers, and gyros will perform after long repeat exposure to vibration. The good news is the lower frequency vibrations produced by a slower turning gas engine are not as destructive on electronics or mechanical components as the high frequency vibrations that can occur with a nitro engine. 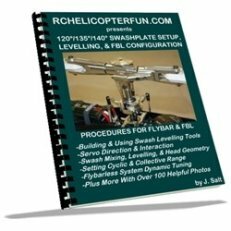 Keep in mind however, performing required safety maintenance like checking all fasteners and operation of equipment on a gas powered RC helicopter is very important.